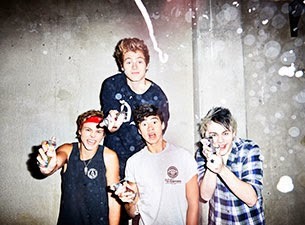 5 Seconds of Summer will play their final London concert at Wembley Arena on Sunday, June 14, following a pyrotechnics incident the night before that left guitarist Michael Clifford with burns to the face. "Michael is recovering well after being given the all clear by doctors," a rep for the band said in a statement to Billboard. "He will join the band on stage tonight at the SSE Arena for their third and final London show. Michael and the band would like to thank all the fans, well wishers and particularly last night's audience for their support. There will be no pyrotechnic production for the show this evening." During 5SOS's performance of "She Looks So Perfect" last night, Michael's hair caught on fire by the pyrotechnics on stage. Shortly after, drummer Ashton Irwin informed the crowd that the set would be cut short. "Michael has hurt himself so we will not be continuing the show right now," Irwin said. "Just want to say thank you so much for coming. He is OK. You guys have been the best crowd we could ask for tonight. Thank you so much."